Thyroid, Parathyroid, Adrenal, Endocrine Surgery, What does parathyroidectomy (removal of the parathyroid tissue) involve? The aim of the surgeon is to remove the abnormal parathyroid tissue, having first localised the abnormal tissue pre-operatively, leaving normal parathyroid tissue behind. The perfect result is a normal serum calcium, a normal parathyroid hormone level, an unchanged voice and an almost invisible scar. The traditional approach has been to use general anaesthesia, but some parathyroids can be removed under local anaesthetic if necessary. A small incision is made in the neck to allow the surgeon to explore all the parathyroids, and then any problematic glands canbe removed. This is a very specialist field with no role for enthusiastic amateurs. This approach is safe and 98% effective. Some surgeons perform intra-operative ultrasound to localise the parathyroid tumour.The Newcastle Group of Endocrine Surgeons presented their results to the BAETS in 2010 and suggested that surgeon- based ultrasound (SUS)had merit. My personal experience of it is that it can be useful in complex cases. There are a number of possible types of operation: These are described in considerable detail in the parathyroid introduction. The number of parathyroids resected depends on the pathology and changes in the intra-operative PTH level as parathyroid tissue is removed. The advent of high quality scanning demonstrating some 80% of parathyroids has resulted in some parathyroid surgeons exploring only one area of the neck if the parathyroid tumour is located (described in the section on 'tests done prior to surgery'). This approach is called Scan-Directed Minimally Invasive Parathyroidectomy and is our favoured approach where possible. If available intra-operative PTH levels should be measured as this improves the cure rate. The abnormal tissue is removed, leaving some normal parathyroid tissue behind and is generally used in cases of secondary or tertiary hyperparathyroidism. All the parathyroid tissue is removed. 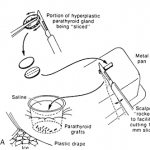 Total parathyroidectomy is accompanied by the implantation of some normal parathyroid tissue dissected from the patient's own glands into the patient's forearm. This implant will act as functioning parathyroid tissue. Modern technology is no substitute for expert surgery. The development of minimally invasive techniques in the abdomen has encouraged endocrine surgeons to apply them to the neck for parathyroid surgery. These exciting developments must be judged against the background of the superb results achieved with traditional surgery where scars are near invisible and voice change virtually unheard of. A more detailed account of parathyroid surgery, including the details of the operation, are given in the introduction to the parathyroid section and also in 'How is a traditional parathyroidectomy performed?' This latter itemis written primarily for surgeons and contains pictures of surgery that some people may not wish to view.